"Classical Revolution" Chamber Music Jam | Mission Dist. “Classical Revolution” Chamber Music Jam | Mission Dist. *Free, but a $5-20 donation is welcome to support the musicians. 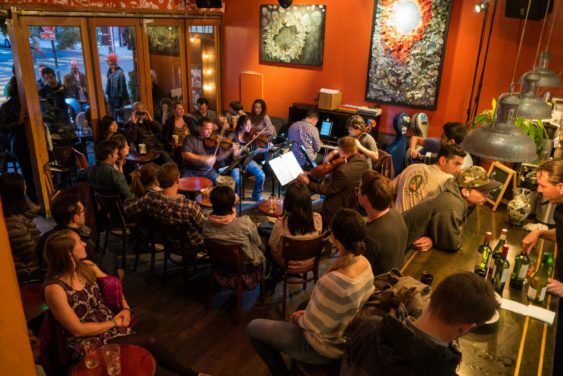 “Classical Revolution” is a bi-monthly chamber music night at the Mission District’s Revolution Cafe. They feature different local and visiting musicians in a unique Chamber Jam format, where musicians get a chance to perform in a casual environment and audiences get to hear chamber music in a relaxed setting. The event is put on by Classical Revolution with the goal of bringing live chamber music to the neighborhoods, making it an open, accessible, and fun musical experience for the community. >> This event is scheduled for every first and third Monday, but please note that the schedule is subject to change. Please check out the Classical Revolution Facebook page to confirm performances. Mon 5/20 “Classical Revolution” Chamber Music Jam | Mission Dist.